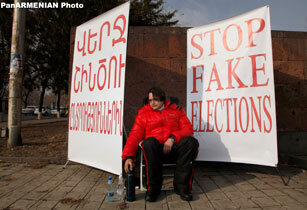 The credibility of Armenia’s Presidential election is still in the balance. Presidential candidate starts his campaign with a hunger strike. With less than four weeks left before the Presidential Election in Armenia on February 18th the credibility of the whole process remains in the balance as an unusual situation develops with several of the eight candidates refusing to campaign, or announcing their withdrawal.